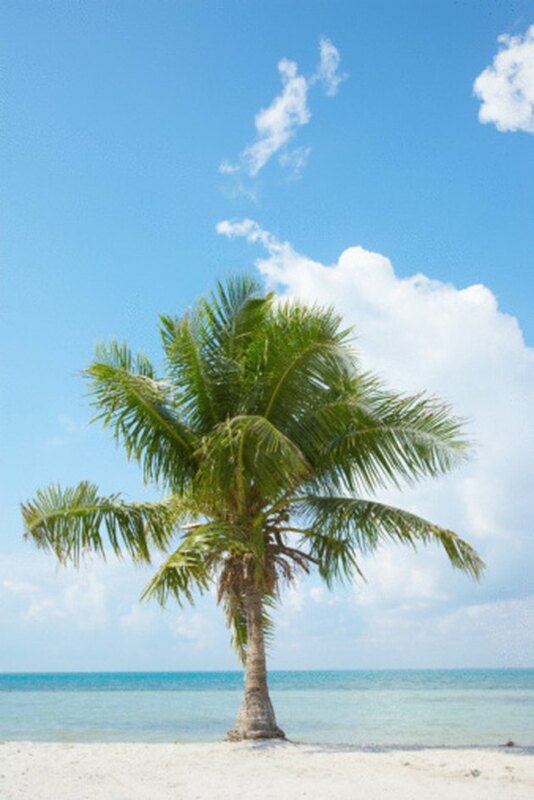 Palm trees are native to the tropical and subtropical regions of the world and thrive in hot and humid weather. Palms are just as susceptible to diseases, pest infestations and management-related disorders as other plants. Choosing a palm variety that is best suited to the local growing condition and providing adequate care are critical steps in preventing most diseases. This includes the disorder referred to as frizzle top. Palm trees are susceptible to the disorder frizzle top. Frizzle top in palms is a disorder that results from inadequate cultural management and is not a pathogenic disease. Palms that are deficient in manganese, a required micronutrient, develop this disorder. Micronutrients are also called trace elements or minor elements and are required by plants in very small amounts. Manganese works with the enzyme systems in plants to process carbohydrates and helps with nitrogen metabolism. Manganese deficiency in new foliage of palms is characterized by yellow discoloration and yellow streaks along the veins. The foliage size is also smaller and growth is frizzled and distorted. New growing leaves are withered, and older leaves continue to look scorched. Queen palm and pygmy palm develop a distinct flat-headed look. The deficiency of manganese occurs naturally in plants growing in a pH of over 6.5 and in poorly drained ground that is rich in organic matter. Drought-stressed plants are more prone to the disorder. Palm trees growing in alkaline often develop frizzle top. Cooler soil temperature can lead to occurrence of disorder. Add manganese sulfate to the soil as a source of manganese to cure frizzle top disorder. The product is easily available at garden supply stores. Manganese sulfate is not the same thing as magnesium sulfate, the active ingredient in Epsom salts. Check to see if the palm fertilizer you are using contains manganese. If not, then you need to add manganese to the regular, annual fertilizing regimen. Depending on the size of the tree, spread 1 to 5 lbs. of manganese sulfate evenly under the tree and water well. Why Is My Palm Tree Getting Brown Leaves?